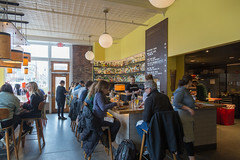 The Honey Paw is a relatively simple spot, it’s basically a two large bars complemented by some high-top counter seating looking out the windows, with a semi-open kitchen. It makes for a nice “noodle shop” communal dining feel, and that’s basically what The Honey Pot is: a pan-Asian fusion noodle shop that branches out a bit into various Asian appetizers and rice dishes as well. Settling back with a nice pot of Lapsang souchong tea as we looked over the menu, we rather liked the assortment of dishes: several good looking dumplings, lobster toast (a nice Maine riff on the standard shrimp toast), larp, and papaya salads for appetizers, and noodle dishes ranging from Japanese to Thai in inspiration. 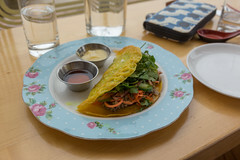 We ended up starting out with a Vietnamese masa crepe (err, that’s basically Asian fusion for ‘taco’) with a chicken larb in it, and we were pleasantly surprised by this dish. I usually like larb to be incredibly spicy, and while this version wasn’t terribly fiery, it was very flavorful: each little bite of spicy and tangy ground chicken and cilantro combining nicely with the crunch of the outer wrapper. The same sort of textural and flavor combination that makes the classic “Korean Taco” work, this Vietnamese-inspired version was quite flavorful as well. For my main dish, I opted for the Hokkaido Ramen, with noodles, mushroom, corn, soft egg, bok choy, and nori. 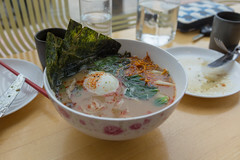 While I usually find that a good ramen is built upon a rich pork broth, this was a solidy-performing ramen built around some very-nicely executed house-made noodles with just the right amount of firmness, the broth starting to soak into the noodles. A generous amount of mushroom, corn, bok choy built this out into a satisfying dish that I’d love to get again. 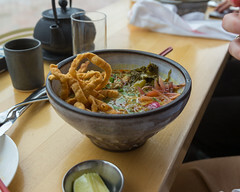 Carol opted to go more in the Thai direction, selecting the smoked lamb khao soi, with egg noodle, Burmese coconut curry, fermented mustard greens, crispy fried noodle, and lime. Served more as dressed noodles than a soup, this was still quite delicious and flavorful: a nice, soft-smoked lamb, a good red-style curry sauce, and some nice texture and mouthfeel from the greens and two types of noodles. Again, a pleasing dish. 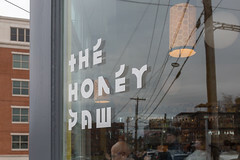 Overall, we were quite pleased with The Honey Paw: it’s a pleasant dining experience with some well-executed Asian fusion food; I can definitely see why this place routinely has a waiting list, even for our mid-afternoon Saturday visit. I’d be more than happy to come back.